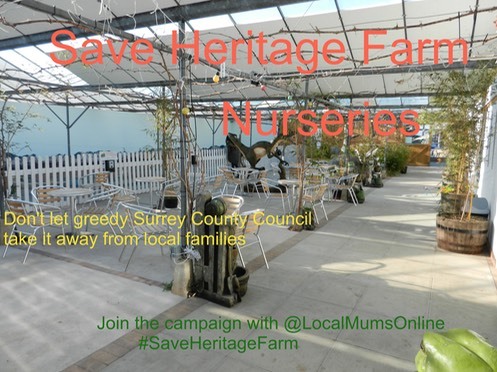 Local Mums were devastated by the announcement today that Heritage Farm Nurseries in Wallington will be closing its doors for the last time on Sunday, 13th January, 2013. The closure has been forced upon the hugely popular family-run business by Surrey County Council. The local attraction, which boasts an aquatic centre, an impressive play area with Thomas the Tank Engine train tracks and family-friendly cafe, is a much-loved haven for local families and is enormously popular with local children. "We are absolutely stunned," said Local Mum Marie. "My son burst into tears when I told him. He adores�Heritage Farm Nurseries�and the Thomas trains. There really is nowhere else to go." "Surrey County Council won't listen and haven't for months now despite my emails, recorded delivery letters and phone calls," explained Fiona, who has four children and will lose her family home as well as the family business. "No one from the council could even be bothered to meet us face to face or answer my messages and queries." Fiona and Jonathan have been forced to make their 20 staff redundant and sell all their stock this week. "We were told that if we didn't sign the deal the council would just find another company that would take it on and pay what they were demanding. No negotiation. Nothing. But we will not leave anything here for them to rent to someone else. It will all be gone over the next few weeks." "I am so upset and angry right now," continues Fiona. "This is not just a business it is my family home that they are evicting us from as we live on the same site. Our whole life has been utterly destroyed and pulled from underneath us because of a council worker who thinks he knows best." "We were led to believe we were here for life, hence the investment," says Fiona. "But all the council want is as much money as they can get. They want over 1 million pounds plus a % of our turnover on a site that was derelict when we moved in." Within minutes of the announcement Local Mums' network Carshalton Mums - which has a huge loyal following for�Heritage Farm Nurseries�- was inundated with messages by distraught mums. "I have never seen such a strong reaction to a local business closing," said Editor and Founder of Local Mums Online, Kathy McGuinness. "Heritage Farm Nurseries�is undoubtedly one of the most popular places for local families to visit and we are devastated that the council are closing it. The council should be supporting family-friendly ventures such as this, not forcing their closure. We are disgusted at Surrey County Council's behaviour." Local MP for Carshalton and Wallington, Tom Brake, told Local Mums Online: "Heritage Farm Nurseries�has become a successful local business, a popular attraction for local residents and a source of employment for many people. "I have made repeated representations to Surrey County Council to ask the Council to negotiate a mutually acceptable solution. I am very disappointed that Surrey County Council has failed to come to a suitable agreement with�Heritage Farm Nurseries. To force the closure of this popular local business will benefit no one; neither the business’s customers and its employees nor Surrey County Council. "I hope that there might still be time to save�Heritage Farm Nurseries�and for an appropriate rental agreement to be reached." Tom Brake said that he is contacting David McNulty, Chief Executive of Surrey County Council, again today to ask him to reconsider his position and offer a rental agreement that will allow�Heritage Farm Nurseries�to continue to prosper. Head of Sutton Council, Ruth Dombey, also told Local Mums Online: "I’m so sorry to hear of the closure of�Heritage Farm Nurseries. I wrote to the Leader of Surrey County Council back in November 2012 to add my voice to Tom Brake’s and try and encourage him to find a solution. He never replied to me and he obviously hasn’t listened to our concerns.�It seems very harsh on the owners and the many people who enjoyed the benefits of this local business." A protest meeting will be held at�Heritage Farm Nurseries�on Sunday, 13th January at 2pm. All welcome. Please come and show your support!